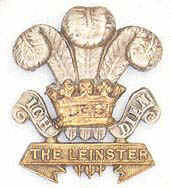 This page has been created as a tribute to the life of the Leinster Regiment Association's member number 1, Major J.M. MacLeod MBE known affectionately to all members as "JIM" or sometimes more formally as "the major". Jim MacLeod died unexpectedly on the 21st October 2007 age 72 though it has to said that all members considered Jim to be a very young seventy-two! As becomes member #1 Jim had been a tremendous support to the Association's first chairman, Vincent McGough and Secretary David Ball. It should be no surprise therefore that Jim threw his weight behind me when it fell upon me to take over as chairman of the Leinster Association. Jim's funeral took place on Wednesday 31 October 2007 and, along with several members of the Association, I had the privilege of attending his tribute service in the afternoon. Many of the Association's members will have been unable to attend the service at such short notice and so the Leinster Association have produced extracts from the tribute service for the benefit of the membership. Peter Scott, Secretary of the Combined Irish Regiments Association and John Fallis of the London Irish Rifles Regiment Association both paid tribute to Jim and you can listen to their tributes and view some photos of Jim that we and the Combined Irish Regiments Association have in our collections. Included as a slide show is the music of the Pipes and Drums of the London Irish Rifles, played at the tribute on the 31 October, that starts with a piece composed by them in 2006 called simply Major J M MacLeod MBE. The band played indoors at the tribute and the recording quality is not so good - nevertheless the recording will provide you with a sense of the level of tribute paid to a man who had the respect and affection of us all. Notice: The streaming video file sizes are very large around 6 MB each and you should not attempt to view the tribute unless you have a Broadband Internet connection. You also need to have installed on your PC the Photodex plug-in to view the video. When you select the tribute to view, as the web page loads, if you do not already have the plug-in, you will be given the option to install the browser plug-in from the Photodex Corporation. Click the Yes button to install the software application. This is a one-time operation and once completed you will be able to view any of the Tribute pages; plus other videos prepared with the Photodex application.